Here's the source code for three text adventure games: Adventure in Time, Birth of the Phoenix and Queen of Phobos, all published by Phoenix Software. I got these from the programmer, Paul Berker. My interview with him will be published in the ANTIC podcast soon. Adventure in Time and Birth of the Phoenix includes both Apple // and Atari versions, because the Atari version was cross-compiled from the Apple. Note these are Apple // .DSK files. The modem version was a special version that allowed you to play the game online, presumably. Queen of Phobos was only made for the Apple //. It was a graphical game, and I don't think this is the complete source code. Edited by Savetz, Sun Nov 6, 2016 6:50 PM. Man, I loved those fuschia colored Verbatim disk sleeves...I have a ton of them still, wonder if they are still readable?? Cool stuff - it's great that these programmers still have (and share) their code...thank you! Thank You so very much, Kevin, for all you do for the Classic Computer Enthusiasts!!!!! 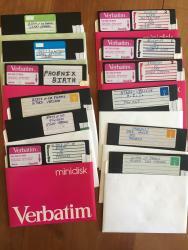 Phoenix Software's first game. Thanks, Kevin!